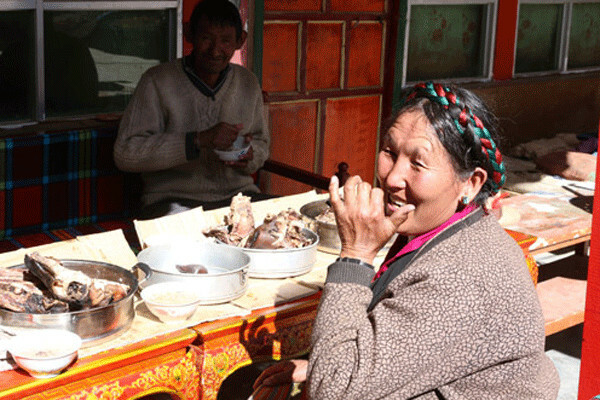 Losar,or Tibetan New Year is the most important festival in a year for Tibetans. Then what is different in the way they celebrate Losar from the Spring Festival? And what do they do from the New Year’s Eve to the fifth day in the New Year? 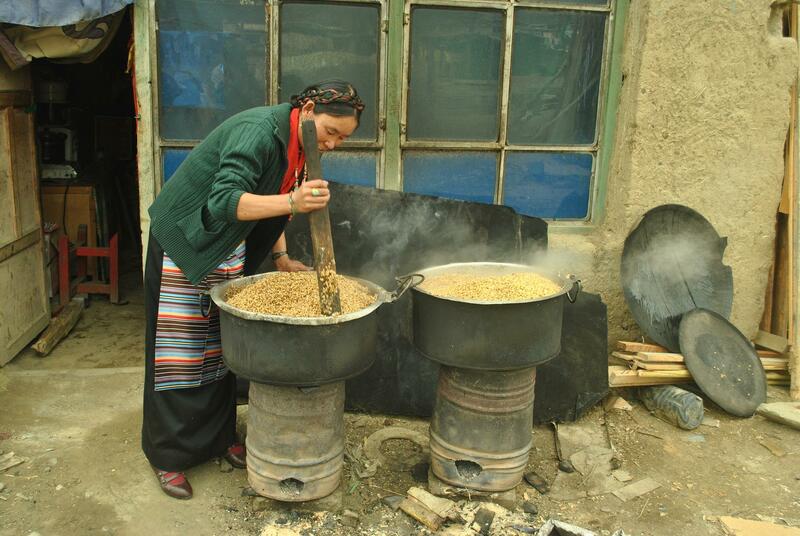 The picture shows a Tibetan villager brewing highland barley wine. 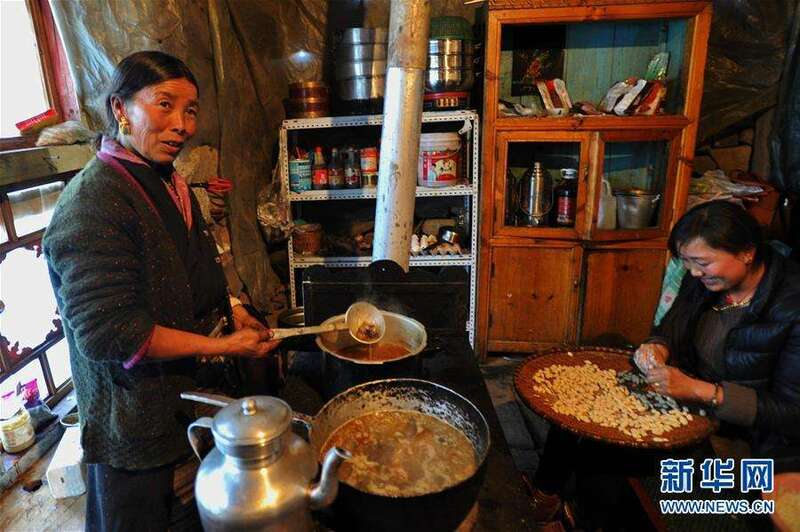 Tibetan people usually begin to celebrate New Year on the evening of the lunar Dec. 29th in Tibetan calendar, when they eat dough balls called “gutu”, because “gu” in “gutu” means “9” in Tibetan and “tu” means food made from flour. The dough balls may contain stones, wool, chili, charcoal or coins. Different contents symbolize different meanings, namely, wool stands for kindness, stone for ruthlessness, charcoal for cruelty and coin for wealth. Everyone would spit out what they get from the dough and it usually causes a laugh. The picture shows a hostess and her daughter in the kitchen cooking gutu. Early morning on New Year’s Day, the housewives carry buckets on their backs to the river or well to collect water for the New Year. Legend has it that water at this time is the most holy and sweet, and whoever first gets the lucky water will have her family spared from disasters in the New Year. At dawn, the whole family put on their festive clothes and get washed. Then they wish each other best wishes for the New Year by saying “Tashi Delek” (best wishes), which is a traditional custom often started by the younger generation. Following this, they eat breakfast and drink highland barley wine. The picture shows a host and hostess enjoying New Year’s food. In pastoral areas people eat sheep’s head on New Year’s Day. At five o’clock in the morning, the housewives begin to boil sheep’s heads for the whole family, one for each. Once boiled, they are placed in front of the oldest man in the family using a wooden tray, and he dishes it out to each person in order of seniority. The whole family sits around the stove eating sheep’s heads and wishing each other everything goes well in New Year and growth and prosperity of the livestock. Starting from the second day of the New Year, people start visiting and entertaining each other. During New Year the first words exchanged are “Luosang Er’rang” (Happy New Year)or “Tashi Delek” (Best wishes). When visited by friends and relatives, the host comes out to greet his guests with a “Qiema”, or lucky bucket, and the hostess brings a copper pot of alcohol draped in Hada to toast the guests. Everyone wishes each other “Tashi Delek”. Tibet’s largest religious festival, the Great Prayer Festival, takes place on the fourth day of New Year. This dharma assembly has been held since Tsongkhapa, founder of the Gelug Sect of Tibetan Buddhism initiated it in Lhasa in 1409. 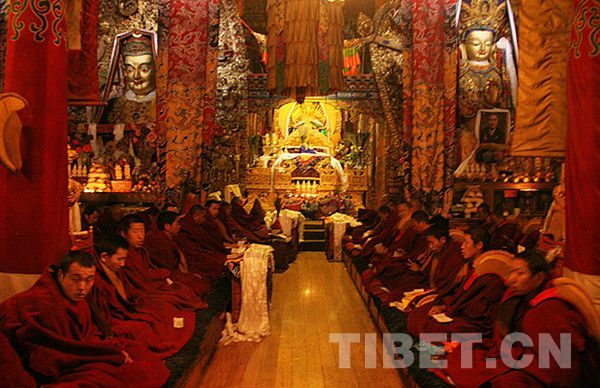 During the ceremony, monks from the three major monasteries of Gelug Sect, the Ganden Monastery, the Drepung Monastery, and the Sera Monastery, congregate and pray before the Buddha statue of Sakyamuni. The Geshe degree exam is also held at this time. The dharma assembly continues until the fifteenth day. The picture shows the ceremony at Jokhang Temple, Lhasa. On the fifth day of New Year, the villagers put on their festive clothes for the grand spring plowing ceremony. Colorful flags are attached to the horns of cows and multi-colored ribbons tied to their tails. Then, they burn cypress and stick prayer flags in the ground as the cows plow. Once the ceremony is over, everyone gets together to drink and sing until the sun set, when they return home in high spirits. 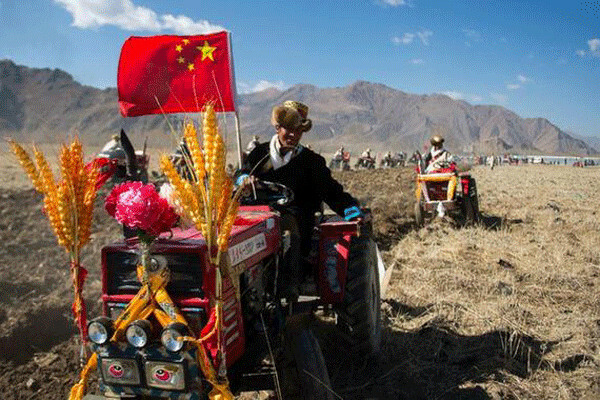 The picture shows Tibetan villagers wearing their festive clothes and holding spring plowing ceremony.